Join a guided three to four hour field tour to experience bighorn sheep in their winter range. This customized tour is perfect for wildlife enthusiasts, photographers and small groups. 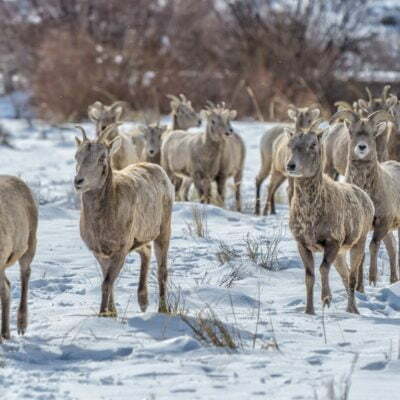 We begin the tour at the National Bighorn Sheep Center, providing a thorough background introduction to the Whiskey Basin Habitat area, bighorn sheep biology and the history of wild sheep. We then drive to specific locations where bighorn sheep have been recently sighted and learn more about their habitat and biology in the field. Optional hiking is available to additional sites. We provide binoculars, transportation and knowledgeable guides, and we can also arrange for bag lunches if desired – please inquire. Groups are welcome. We do require a deposit and at least 48-hour advance notice. Tours cost $100/person (for two or more people), or if desired, one person can attend for $200. Sorry, no pets allowed. Mention that you read about this 2018//2019 package deal on the Wind River Visitor’s Council website and get $20 off the total tour rate. We can also accommodate larger groups at reduced rates, so please contact us for more information. Please call us today 307-455-3429 to reserve your tour.